Columbus, Ohio (August 24, 2010) — The increasing demand for rack-backed computing capacity, and the IT systems and equipment necessary to deliver that capacity, is stretching the limits of existing data center spaces. With that in mind, Emerson Network Power, a business of Emerson (NYSE: EMR) and the global leader in enabling Business-Critical Continuity™, today introduced in North America the Liebert GXT3 uninterruptible power supply (UPS) system in 5-10kVA models. The true on-line double conversion Liebert UPS system, which is an extension of the existing Liebert GXT3 product line, enables IT managers to pack higher power capacities into smaller spaces while maintaining best-in-class availability. The Liebert GXT3 can be installed in a rack or tower configuration, with a rotating LED display panel that adjusts accordingly. The Liebert UPS features replaceable, hot-swappable internal batteries that provide four or more minutes of runtime at full load, with higher backup time available at typical loading conditions. The 5kVA and 6kVA models require only 4U of space, while the 8kVA and 10kVA models require only 6U of space. 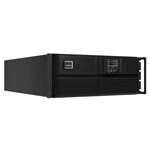 Optional battery cabinets, adding just 2U to 4U of rack space, provide additional runtime via the plug-and-play connections on the rear panel of the UPS. Using the Liebert IntelliSlot® Web Card, the Liebert GXT3 provides simple network management protocol (SNMP) for ongoing Web-based monitoring and control of the system. A Windows-based configuration program allows operating parameters to be adjusted and tests to be scheduled, and built-in USB communications for use with Liebert MultiLink® enable the customer to monitor UPS and server communications and ensure proper, unattended shutdown. Built-in closure signals provide automatic notification of operating systems such as low battery or battery mode shutdown. Liebert GXT3 is backed by the industry’s best warranty. A two-year, no-hassle replacement warranty pays for shipping for both the original and replacement unit in the event of UPS problems. Additionally, the product may be purchased as part of the Liebert Power Assurance Package, which includes the Liebert UPS; on-site system startup and a preventative maintenance visit in the product’s third year after installation, both from a certified Emerson Network Power Customer Engineer; full parts coverage, including internal batteries, for five years; and on-site repair or replacement service, with a guaranteed four-hour response time, for five years.